Runners will be required to pick up the specially designed, commemorative bib, technical participant shirt and other event material during the designated Packet Pick-up times. Runners must show the E-card at Packet Pick-up either printed out or displayed on phone. Thursday, June 13 and Friday, June 14 from 7:30 a.m. to 7 p.m. at the Marine Corps Marathon building. Runners are encouraged to attend Packet Pick-up prior to event day. However, packets will be available on on event day. Extended wait times to obtain a packet on event morning could delay participation in Run Amuck. For runners unable to attend Packet Pick-up, a designated representative may obtain event materials with proper documentation. The individual picking up the bib for a registered runner must present a hard copy of the completed E-card with a copy of the runner's photo ID, as well as a copy of his/her ID. Please obtain the runner's preferred shirt size. Minutes away from Marine Corps Base Quantico and the Run Amuck course, the Holiday Inn Quantico Center is dedicated to help make runners' stay unforgettable. Hosted aboard Marine Corps Base Quantico, starting at Butler Stadium, Run Amuck course includes more than 20 obstacles and a scaled "mini" version. 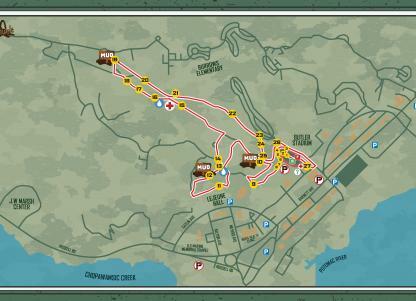 Run through four miles of mud and obstacles throughout the trails of Quantico, VA.